This article was written by Rob a couple of years ago for the GEO Quarterly. Unfortunately some of the kit mentioned is no longer made. I will update as new information becomes available. Rob's suggestion of second hand equipment is one that should probably be followed. Some commercial kit is very expensive with one complete system retailing at over �20,000 and one of the receivers at over �2,000. Since the loss of direct WEFAX reception from Meteosat, things have never been the same for me with the hobby, although we now have Eumetcast and exceptional images, it takes away that satisfaction of direct reception. Whereas I used to really enjoy the hobby, having it on a plate now with Eumetcast seems to take away the pleasure I once had. Don’t get me wrong, I’m grateful for what we have with Eumetcast, and the excellent image quality and resolution seen like never before, but being a ham with a curious mind, I prefer the satisfaction of direct reception. I decided that HRPT was the way to go. This article describes some of the steps and issues in setting up and using an HRPT station. HRPT stands for High Rate Picture Transmission. APT is a derivative or by product of HRPT. APT is 4km per pixel resolution (fig 1) & HRPT is 1.1km per pixel resolution (fig 2). It’s still received from the same polar orbiting satellites that bring you your APT images e.g. 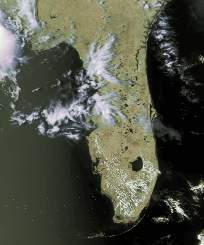 NOAA’s 18 and 19. A dedicated HRPT receiver, a normal APT receiver will NOT work, the HRPT receiver has a wider bandwidth. Then you need the decoder, amplifier, Downconverter, Dish and feed, Rotator and controller. It all sounds rather complicated, but taken one step at a time, not so difficult. The main choice of receivers I liked were available from Nuova Elettronica, Quorum, and Dartcom. 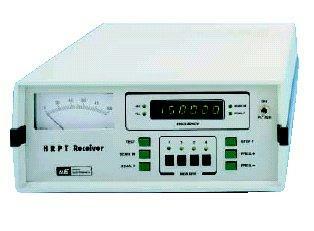 The receiver LX1495 (fig 3) I chose was from Nuova Elettronica in Italy. (no longer available). 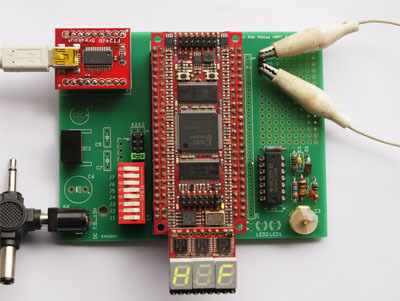 There are several HRPT decoders on the market, but I chose the Rob Alblas design. Picture is of 2010 design. (fig4). Rob is a member of the Dutch Werkgroep Kunstmanen. 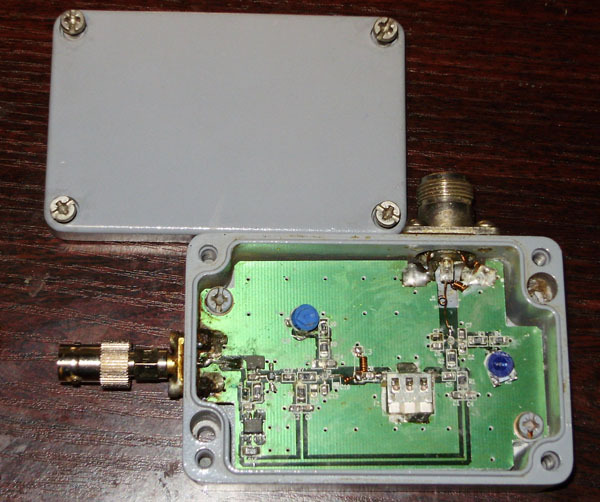 This decoder was the first item I built towards my step of owning and using a HRPT station. Mine was a commercial ready made Pseudomorphic High Electron Mobility Transistor (or P-Hemt for short) purchased second hand from a fellow GEO member for the bargain price of �25, ) (fig 5&7). 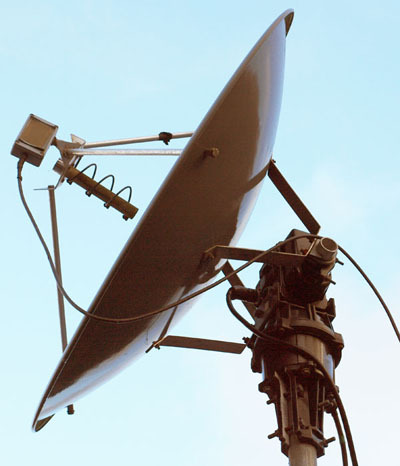 The amplifier is placed directly behind the helical feed in the centre of the satellite dish for maximum signal gain. The P-Hemt field effect transistor tends to give higher gain than the normal FET’s due to the way it’s made, but for the moment let’s keep things simple. Remember the days of WEFAX? Remember that old downconverter you had that became obsolete? (figs 6 & 7)Well, it's not any more. You can give it a new lease of life as part of your HRPT system. 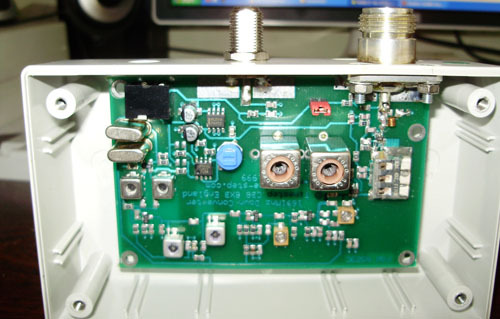 Used in conjunction with the NE receiver it can cover ALL the HRPT frequencies! That's going to save you a lot of money. How can it do the job I here you ask? Well, let me explain. The downconverter is broadband so it will cover from 1690-1710 MHz and the NE receiver covers from 135-155MHz and that’s how it’s done! All the frequencies you'll ever need. The Dish feed of course must match the HRPT receiving frequency of around 1.7GHz. The signal sent is circular polarized so we need an antenna to receive such signals, which usually involves a helical feed. This again can be home made. Again, Gerald Ihninger has antenna feed specifications on his site. So, to sum up, if you were to ask me the way to go, try getting second-hand equipment, and don't be afraid of having a go at making some of it yourself, there are always people around willing to help. Of course if you have the money there are new commercial systems available but at a cost. Figs 8 & 9 are of Robert Moore's Dish, Antenna and Rotator.